We provide underground drainage for gutter systems. Many times flooding in basements and garages as well as foundation damage occurs when underground drains are absent. Underground drains are needed to ensure no water gets back into the home. Why do I need underground drains? During a rainstorm the gutters will catch all the rainwater from your roof and pass it down to the ground. This is a large concentration of water right next to your home. Over time this water can penetrate your foundation, undermine stairs and patios and cause major damage. Gutters draining into high traffic areas such as walkways and driveways often cause slipping injuries. The solution is to take the downspouts underground and away from the high traffic areas. 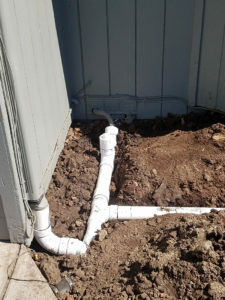 In some cases we even re-route the gutters and downspouts to a different area of the home and then bring them underground to avoid digging up driveways and walkways. Underground drains ensure the water gets far away from your home, keeping your foundation safe and basement dry.